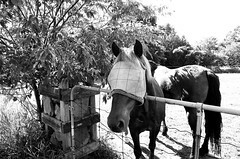 Like a horse with blinders on, avoiding some degree of Big Design Up Front (BDUF) can force your team and project into tunnel vision, because… If you don’t look at what you’re building in its entirety, it is harder to see the big picture, to have to that ah-hah moment that leads to a break through, to maintain conceptual integrity, or have a successful project. I worked on a project where we attempted evolutionary design (avoiding Big Design Up Front) while taking an Agile approach. We used Continuous Integration, and Test Driven Development. Looking back, our attempt at trying to avoid Big Design Up Front was fatal for our project’s success and probably our biggest mistake. The funny thing is, the only reason we avoided BDUF was because it seemed non-Agile (note the capital ‘A‘ in ‘Agile’ read Yegge’s post Good Agile, Bad Agile for the reference). As a development team we were inexperienced Agile (eXtreme Programming) teenagers and somewhere along the way we exchanged our brains for dogma. 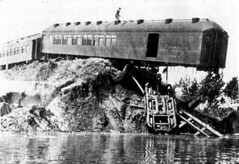 In the past Big Design Up Front (BDUF) was associated with large inflexible architectural solutions that are designed upfront (before development begins) – like the waterfall methodology. However; BDUF (like most techniques / methodologies / tools) are quite useful when used with a sprinkle of common sense and moderation. BDUF can be a productive lightweight tool for fleshing out the high level overview of a system. It is important to note that I’m not advocating Big Architectural Design Up Front which is often composed of reams of documents, UML, ERDs, diagrams, and other unneeded artifacts. Instead I’m advocating for paper based story boards, wire frames, paper prototypes, user stories – anything that is easy to create, destroy, and recreate. These techniques provide the foundation of the final product, they start to verbalize the common product goal and can start to draw out the language, metaphors, and model that will eventually compose the project. Avoiding some Design Up Front was a mistake for our project. As a team we were trying to cope with the complexities of our domain under very tight deadlines. Our code became increasingly brittle, we had overlooked obvious shared functionality that a high level overview would have fleshed out. At the same time we had segregated our application into sprint sized silos with no clear relationships – each sprint was essentially a two week tunnel, and disconnected. the planned design approach has been around since the 70s, and lots of people have used it. It is better in many ways than code and fix evolutionary design. But it has some faults. – Martin Fowler, Is Design Dead? Not doing some Design Up Front is probably another excuse for being sloppy, but what do you think? If you’ve ever landed on Amazon then you’re probably familiar with their reviews and wish lists. Amazon provides access to these items (and many-many more) through their extensive web services – the Amazon web services can be complex and overwhelming when all you want is a review list and a single user specific wish list. For this site I wanted to pull in my reviews and wish list – displaying them alongside my blog. It’s fair to note, that user reviews are available via an RSS feed (but this feed doesn’t include all the details I wanted) and the wish list page still doesn’t provide an RSS feed. So a custom Amazon web service request was in order. Let me try to make this story short. An Amazon Account: http://www.amazon.com/gp/css/homepage.html with at least a wish list or a review. An Amazon Associates tag: https://affiliate-program.amazon.com/gp/associates/join/ (this will be your AssociatesTag). An Amazon Web Service (AWS) access key: http://aws.amazon.com/ (this will be your AWSAccessKey). Get your CustomerId for the reviews. I found my CustomerId by navigating to my reviews (http://www.amazon.com/gp/cdp/member-reviews/A2JM0EQJELFL69/) then pulling out ‘A2JM0EQJELFL69′ (the last element of the url). Get your ListId for your wish list. I found my ListId by navigating to my wishlist (http://www.amazon.com/gp/registry/registry.html/?id=3JU6ASKNUS7B8) then pulling out ’3JU6ASKNUS7B8′ (the identifier after id= from the url). Checkout and download the source code for the project and build the assembly or download the pre-compiled assembly. Add the assembly reference to your project (remember, I’m assuming you’re using .NET). Make a call to the application which will generate XML files containing your respective reviews and wish list. If you’d like to provide some design guidance, fix a bug, or request a feature, then visit (or join) the project on Google Code. Alternatively, you might also be interested in the LINQ To Amazon source featured in the book LINQ in Action.